Coming off consecutive blowout losses at the hands of Louisville and Clemson, the Demon Deacons ended their five -game losing streak Tuesday night with an exciting overtime victory at home over Pittsburgh. The 78-76 win gave the Deacs their second conference win of the season. Pitt, who has gone 12-11 and 2-8 in ACC play, entered the game on a five-game losing streak as well. The Panthers have lost 19-straight road games dating back to last season, which made Tuesday night’s duel a perfect opportunity for the Deacs to get a much-needed win. Pitt stormed out of the gates, scoring the first eight points of the contest in the first two minutes. Wake Forest fought to gain back the lost ground the rest of the half, tying it up at 26 when junior Brandon Childress hit a three-pointer with just under a minute left in the half. Pitt guard Xavier Johnson got a floater to go in as time expired to give the Panthers a two-point lead going into the break. Childress opened the scoring in the second half with a three-point jumper, giving the Deacs their first lead of the game. The score remained close throughout the half as the teams battled back and forth, trading leads and often being tied. The Panthers’ largest lead of the second half was five, when they led 51-46 with just under nine minutes remaining. Wake Forest answered with a 15-2 run, which featured eight consecutive points in less than 80 seconds from freshman Sharone Wright Jr., which consisted of two threes and a pull up 15-footer. Another highlight of the run was a tough finish in transition by freshman guard Mikey Wynn, who flexed his muscle after the bucket and got the crowd on their feet, prompting Pitt to call a timeout. The spurt gave the Deacs a 61-53 lead with just over five minutes remaining. The Panthers responded with a 7-0 run to cut the Wake Forest lead to one with just under three minutes remaining. After a Sidy N’Dir three-pointer and three free throws from Xavier Johnson, Pitt led 67-65 with 44 seconds remaining. The eight-point lead had disappeared, and the Deacs needed to make a play to keep the game alive. 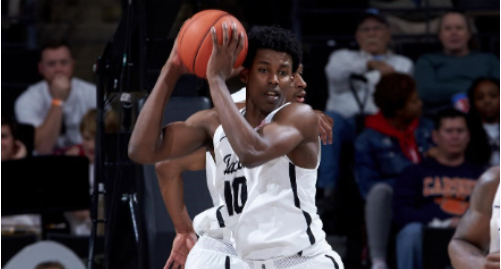 Childress and sophomore Chaundee Brown both missed game-tying shots, but the ball went out of bounds off Pitt and Wake Forest was going to get another chance. Brown missed badly on a three, but Jaylen Hoard caught the airball and banked it off the backboard to tie the game and send it into overtime. “I’m very happy and proud of the resiliency a lot of our guys showed,” said Wake Forest Head Coach Danny Manning after the game. In overtime, Brown took over, scoring eight of the Deacs’ eleven points in the extra period. His shot from beyond the arc with 37 seconds to go gave Wake Forest a three-point lead. Childress rebounded a Pitt missed free throw in the final moments and dribbled out the clock to secure the victory. Childress and Brown each finished the game with 18 points, and Hoard turned in another spectacular effort with 19 points and 17 rebounds. Hoard’s 17 boards were the most by a Wake Forest freshman since Tim Duncan in 1994. “This gives us some momentum heading into this bye week to continue to work and get better,” said Manning. The Deacs don’t play for another week until they travel to play Florida State on Feb. 13, and they aren’t back at home until North Carolina comes to Winston-Salem on the Feb. 16.